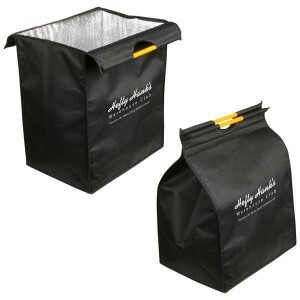 There are a bunch of reasons why clients love our insulated grocery bags. We are pretty sure that one of these reasons has to do with how their usefulness extends beyond the checkout line. Really, it goes without saying. Take a durable reusable bag. Line it with insulating material, for the purpose of keeping its contents cool or warm for longer. Boom! Super-useful, multi-purpose tote! 1. Take out totes. Insulated grocery bags have basically the same premise as pizza delivery bags. Bring one with you when you pick up your to-go order at the store, and your food will be warmer when you get home. 2. Picnic cooler. Heading to the beach? Bringing in your lunch at the water park? Insulated grocery bags are less bulky and easier to carry than a cooler. Put Blue Ice in yours and voila—instant soft-sided cooler. 3. Wet gear bag. While insulated grocery bags aren’t completely waterproof, they can still hold wet towels, swimsuits, wetsuits…you get the idea. Keep your car dry, and your wet gear separate from your other stuff! 4. Closet organizers. Sure, it has nothing to do with food temperature, but some people use their insulated grocery bags as closet or toy organizers. Since they’re thick, they hold their square(ish) shape. Put the items you want to organize in the bags, and hang them by a hanger on a closet rod. Many insulated grocery bags also fit in cubby organizers. 5. Project bags. Since insulated grocery bags have thicker sides, they’re great for toting craft materials—like those used for crocheting, knitting, scrapbooking, or beading. So, what do you think of these alternative uses for insulated grocery bags? Have you ever used them for anything other than grocery shopping? Let us know if you have a clever use that we need to add to the list!